Popping in this 4th of July. It is a rainy sleepy day here. Not the best day for outdoor picnics and gardening. First off, I want to share an article that was in the Houston Chronicle about decorating with Red White and Blue all year round. The writer interviewed me because she loved my book. How cool! Check it out here. 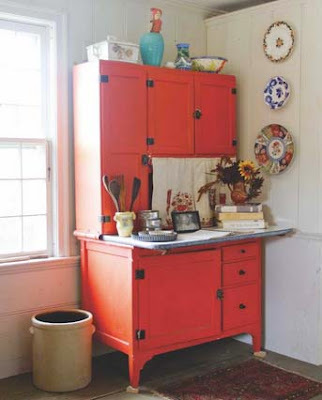 Here is one of the photos from the article which is Red White and Blue themed from my newest book Crafting a Colorful Home. The new photo in my header above is also from my new book. Both photos by the talented Rikki Snyder. For you all on the 4th of July. Boom Boom! I have been meaning to show you all my new summer project that I will be working on. A couple years ago, I found this chair at a junk store. My original idea was to make a slipcover for it out of one of my fabric designs that I have on Spoonflower. I wanted to get it done for my latest book Crafting A Colorful Home. Sometimes plans don't happen and I am okay with that. Sometimes it takes me a few years to make an idea gel and actually come to life. So this summer it is for this chair. I have the fabric and I am going to print it myself and then embroider the fabric. 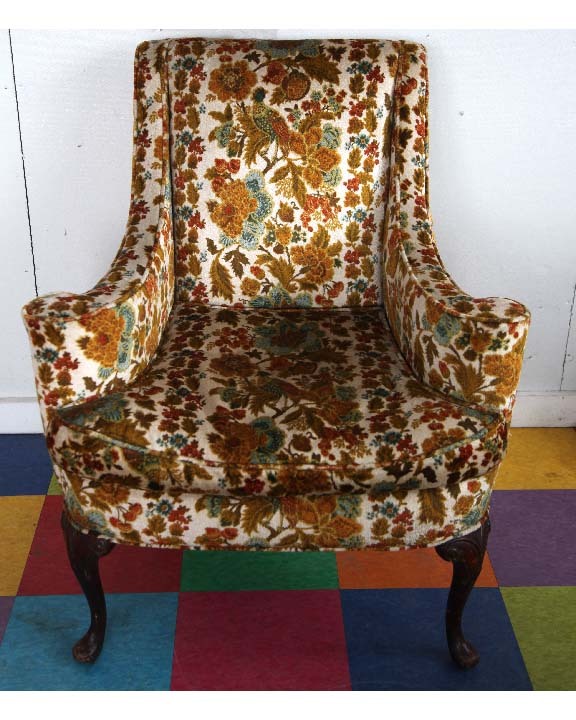 I will be sewing a slipcover out of said printed and embroidered linen fabric. I have never made a slipcover for a chair before. My last experience with slipcovers was in the 1980's when I made 13 cushions for my grandmother's wicker set. I must say, I have felt a bit timid about making slipcovers - always preferring to pay someone to do it for me. But since I don't have the funds, I'm going to do it myself. It could take a year, considering I am printing and embroidering the fabric. But it is going to happen eventually. I feel like I can do it because I have been watching a fantastic Craftsy class called Custom Fit Slipcovers with Cherie Killilea. I've watched Custom Fit Slipcovers a couple times now and I think I can do it. Kind of excited to give it a try. Whenever I get the embroidery done. 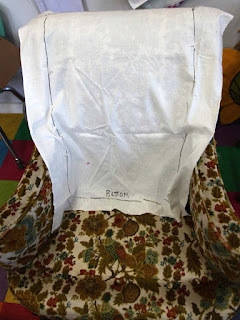 Here is a photo of draping the pattern for the back of the chair. This photo shows making the pattern for the cushion of the chair. My plan is to print both of these pieces and then embroider them while I am sitting at the Farmers Markets this summer. Maybe I will get to the printing today! I hope so. I can't wait to dig into this project and see how pretty my slipcovered chair comes out. Long range project for sure. Have a Happy Creative 4th of July fellow Americans! Good weekend to all of you. Not sure about 4th July, afterall we were on the losing side :) Still nevermind. Your chair is delightful and you've just solved a problem I've got with my brand new cuddle chair that cost me £800 and is slowly getting marks on it. I'll make it a slipcover. Just the thing to keep it looking nice until my messy pair become a tidy pair who would never eat chocolate or crisps on the chair leaving a mess everywhere. I think I will go to the craftsy site and enrol on the slipcover class. Thanks so much Kristin. By the way I have your new book and love it completely. Like you couldn't pick a SIMPLE chair to recover, eh? - A little advice, do a MOCK-UP one out of cheap fabric first! [like old worn sheets] - With all of those curves, you still have to consider stress-points, flaps, some elastic here and there, future shrinkage... And adding embroidery will also tighten up the fabric in spots. - I've seen my mother reupholster enough chairs over the years to know it AIN'T "simply" or easy! Especially on the curvy ones! So take it slow. And MEASURE umpteen times!! Love your chair idea! Please keep us posted on your progress. You can do it!! Also just had a chance to watch the house video and so enjoyed hearing more about your journey. Houzz video -- sorry it auto corrected on me. Thank you so much for sharing such a great blog post, i like this blog too much. and i will try to read this blog on daily basis. Oh my , how exciting!!! I gave a couple of your books to a couple of people in Houston, one has a quilt fabric and knit shop next to our world famous Quilt Museum, ..in LaGrange, Texas......hopefully the word of you will spread and spread!! I think your book should be sold in the museum!! I will check that out!! Your color speaks JOY to me! Congratulations!!! Never quite seen anyone's work as unique as yours with your personal touch!